Naruto: Gekitō Ninja Taisen! 4 (ナルト-激闘忍者大戦! 4, lit. Naruto: Great Ninja Battle! 4) is the fourth installment of this series. It was released in Japan on November 2005. It covers the events from the Return of Itachi arc to the Sasuke Retrieval arc. 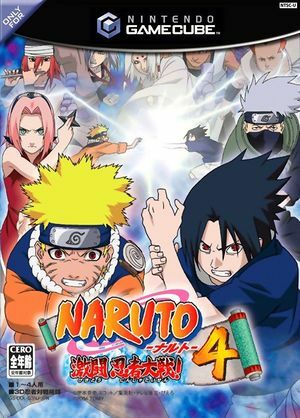 The game also introduces the ability for multiple characters to fight one another at once, ranging from a 3-on-3 match to a 4-way brawl. Most noticeably, the game does away with the shop feature, and unlockables are now acquired by simply meeting certain criteria in the game's new Mission mode. Mission mode forces the player to fight increasingly stronger opponents under specific circumstances and with different methods of winning in order to complete each mission. This game was released exclusively in Japan. The graph below charts the compatibility with Naruto: Gekitō Ninja Taisen! 4 since Dolphin's 2.0 release, listing revisions only where a compatibility change occurred. This page was last edited on 25 July 2018, at 02:36.